Dementia is a disorder of the brain that interferes with one’s ability to think clearly, remember, communicate, and generally function and take care of one’s self. Dementia is most commonly caused by alzheimer’s disease, but can also be caused by a number of other degenerative brain conditions. Dementia is found much more often among older members of the population, so it is typically a child and/or spouse who ends up bearing the responsibility of caring for someone with dementia. 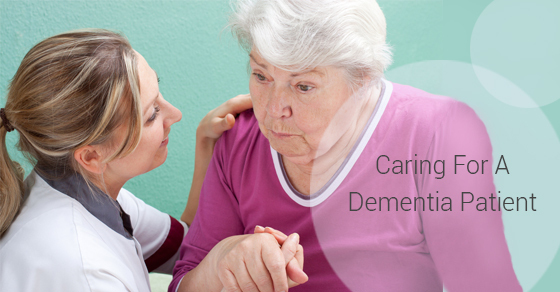 In this article, we outline three tips for caring for your loved-one with dementia. People with dementia often think and process the world in ways that may be profoundly at odds with reality. For example, they may think that someone close to them who died long ago is still alive, or misapprehend where they are at a given time. In these situations, it is best to avoid confronting your loved one with reality, as this can cause them to become upset and argumentative. The best response is generally to engage with the sentiment your loved one is expressing, and to calmly remind them what the reality of the situation is after they’ve had a chance to calm down. You don’t need to go at it alone. Dementia is a complex and debilitating disease, and there are resources available to help meet your loved one’s needs. An experienced Home Care services provider like C-Care can handle the more routine tasks associated with taking care of your loved one so you can better enjoy your quality time together. Taking some of the load off yourself will allow you to enjoy your loved one more on their good days, and will help alleviate some stress on the bad ones. Offering your loved one complex choices can cause them to become upset and confused. We recommend that you either offer a simple choice or avoid offering a choice altogether. Additionally, you should avoid asking open ended questions. For example, do not ask “What would you like for dinner?” Rather, ask, “Would you like chicken or steak for dinner?” or simply state, “We’re having chicken for dinner.” You will be able to feel out which approach works best for you. We believe that these three simple tips can go a long way in making your life as a caretaker easier and more enjoyable. Keep in mind that while your loved-ones cognition is impaired they still experience the full range of emotions. Generally, you want to avoid causing conflict between you and your loved one, as they can become upset easily. These tips will help you accomplish this goal, and will help maintain peace in your household, even during hectic times.